Patterson has the look of a coach leading the nation's top D! Similarly, Tianna has the look of the nation's top tour guide! For all the offensively wizardry we’ve seen from the Broncos during their unblemished season, looking through their schedule it’s tough to defend Boise St’s BCS-bowl aspirations. Besides an impressive early season victory over Oregon, the Broncos played nobody outside of the conference that finished with a winning record (Idaho St., Bowling Green, So. Miss) and had the luxury of playing a collection of WAC teams that were absolutely abysmal this year! Boise St. dominating the WAC is like Pebbles getting plenty of sleep without Bam-Bam around! Nothing highlighted this more than a three week span to start November where Boise St. played (3-9) New Mexico St., (3-9) Utah St., & (2-10) Idaho. Coupled with down years for Nevada, Fresno St, & Hawaii, and the undefeated Broncos had little to stand-on when complaining about their disrespect in the polls. Finishing his career against TCU could leave him like this! Tonight, the high-powered Boise attack led by RS-FR QB Kellen Moore (25 TD, 9 INT, 70%) has the opportunity to prove their greatness against the nation’s #2 ranked defense. And in my opinion, the somewhat slow feet of Mr. Moore will be in for a culture shock with the size & speed of the Horny Frogs relentless attack. 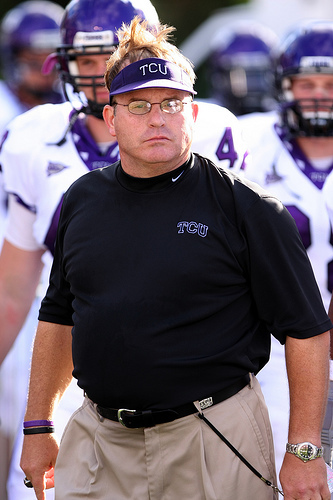 With the NCAA's leader in sacks & forced fumbles DE Jerry Hughes (14 sacks, 6 forced fumbles, 18.5 tackles for loss), DL Cody Moore (6 sacks), and a bevy of big bruisers controlling the line-of-scrimmage, Coach Gary Patterson will have the luxury of dropping plenty Frogs in coverage to confuse the young signal-caller. While star LB Robert Henson has been ruled academically ineligible for tonight, the kids in purple have plenty of talent to replace him, including SR. LB and team leader Jason Phillips (12 tackles for loss)…the brains behind this lethal defense. Just like Megan's 100% flawless, TCU's RBs are 100% healthy! On offense for TCU, while they’ve been inconsistent at times this season with their spread attack, nagging injuries to their top two RBs was the main culprit. In the season finale, both the bruising Jr. Joseph Turner & the shifty Sr. Aaron Brown looked close to 100% as they steamrolled a solid Air Force squad for a 44-10 victory. In addition, with their power running game back in place, 6-3 So. QB Andy Dalton was able to open things-up for the passing game completing 21 of 27 for 321 yards, 2 TD, & zero picks. Jimmy Young has the look of a Sunday Funday playmaker! While the Frogs are loaded with plenty of speedy duel options for the spread and a solid possession TE, the real playermaker and future Sunday gridiron contributor is 6-1 So. WR Jimmy Young (1003 yards, 17.1 avg)...and trust me, he'll make one play tonight that reminds you how the bad the Chicago Bears WRs really are! The Horned Frogs game plan will be solid gold tonight! While the Broncos D looks solid on the stat sheet, they’ve really played nobody with much size and are extremely undersized up-front. As a result, look for Coach Patterson to hammer the ball early to wear down Boise before opening things-up with some play-action as the game progresses. Turnovers & penalties have been the biggest Achilles heel for TCU this season, but I expect with the added time to prepare you’ll see a much more disciplined group itching to spoil the Broncos dream season. I know I haven’t talked about the Broncos solid rushing attack with eighth-year Sr. Ian Johnson (738 yrds, 5.2 avg) and lil So. Jeremy Avery (613 yrds, 5.6 avg. ), but considering the nation’s most dominate ground defense has allowed teams to average only 1.7 yards per carry this season…I’m not worried about that at all. With that, time to hit-up some NBA ATS Action Fellas! Teasin' T-Bone told me he luvs two things today...the Horned Frogs and Asian artwork! I love the Horned Frogs -3 today for many reasons, but the biggest one is their chastity belt-like D. Lets just say that I would hate to be the future daughter of any of their starters on that side of the ball, cuz they simply shut people down. I look at their 2 losses and think that they did better than most teams in the nation would have. To only give up 35 points to an Oklahoma Sooner squad that averaged over 60 a game against the Big 12, and only giving up 13 to Utah(in what should have been a win) who has a potent enough offense to give Bama a run for their money. I know that Boise has put up points, but many of them were on the blue turf and all of them were against their pathetic conference foes. I don’t think the Broncos have enough trickeration to get the Horned Frogs defense on their heels. Surprisingly enough, with both of these teams scoring nearly 40 a game, I firmly believe defense wins championships...just ask Missouri! After loungin' around in Denver last night, look for the Nate McMillian to have the boys fired-up in Portland tonight! Greggy G for free & Labatt Blue for two...what else you need!? This page contains a single article from December 23, 2008 12:04 PM. The previous days article was Your Monday Night ATS Wonderland. The next days article was ATS X-Mas Eve in Hawaii w/ Chubby Charlie.